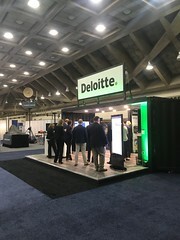 Deloitte works across more than 20 industry sectors with one purpose: to deliver measurable, lasting results. 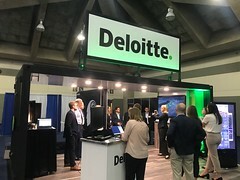 Deloitte leads its strategy through auditing and technology, while helping businesses find new and innovative ways to make the most of opportunities. Clients count on Deloitte to help them transform uncertainty into possibility and rapid change into lasting progress. 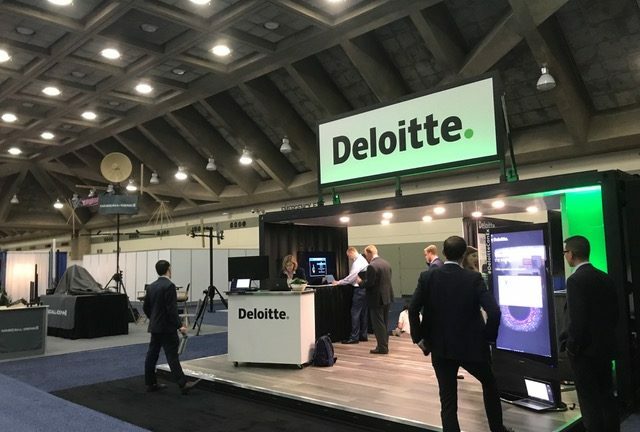 And now, Deloitte is hard at work developing artificial intelligence in military operations, starting with smart bases, where the firm is lending its consulting services to government agencies such as the Department of Defense. Our challenge was to create a display/ expo space to showcase their VR and digital interface technology products. To support their packed event schedule, the structure needed to be designed and built for simple activation and versatility of form and aesthetic to accommodate for different aesthetic wants and space constraints. Boxman designed a structure with a 20’x8’ footprint and double cabana doors. The layout was designed to feel open and spacious, with plenty of room for mingling and exploring. Their technology packages, branded walls, and touch screens were strategically placed to capture attention, and draw event attendees into the space and into a conversation. The topper on their stunning display was their 12’x4’ branded sign. 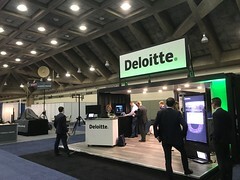 Powered by actuators and illuminated by 8 LED lights, the signage visually brings the entire structure together, and give Deloitte’s space enough height and recognition to act as a way-finding beacon in large activation spaces. Their first event at the MILCOM 2017 conference was a success! 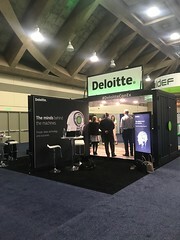 The finishes and modern design made people stop and take a second look, but Deloitte’s technology options really made their exhibit pop! 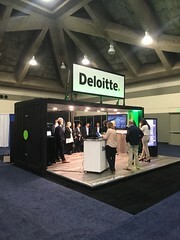 Intuitive mobility and versatility of the structure means Deloitte will have no problem easily activating their space at ongoing event engagements. We had a great time helping this company display their vision and we are excited to see their future events and products. 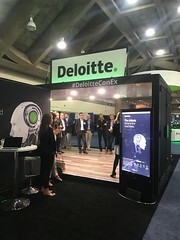 If you’d like to see more about this event, check out the hashtag used #Deloitteconex on Twitter.